Editor’s note: You may have missed the original version of this article last year. We’ve updated it and are sharing it now because video is only growing as a critical tactic for content marketers. Video is a powerful storytelling medium: Not only can it serve as a prime proving ground for your business’ promotional campaigns, influential ideas, and experimental content efforts, video’s emotionally resonant combination of sound, motion, and visuals can also help you drive deeper, more satisfying relationships between your brand and its audience. In addition, younger generations are increasingly communicating through visual means –including GIFs, live-streaming, and social media platforms like Instagram and Snapchat. In short, it’s hard to deny that brands that aren’t embracing video internally and growing their expertise are going to fall further and further behind. Can be archived for the ages, or produced on the fly as live-streaming events on messaging platforms like Live.ly, Facebook Live, or Periscope. As with any content effort, your video-based storytelling needs to be supported by a deliberate, strategic plan. Among the components of your plan should be an outline of the core message you want to communicate, how you want the audience to react, and what the next steps are that you want them to take after viewing. You should also consider how you want your videos to reflect your brand’s values and aesthetics. For example, the content marketing team at REI – a top outdoor lifestyle brand that has received high praise for its video program – built its video strategy on a solid foundation of internal brand guidelines and clearly defined brand voice. According to REI’s Managing Editor Paolo Mottola (2017 Content Marketer of the Year), this base has helped his team provide a consistent audience experience, no matter what stories they decide to tell at a given time. TIP: How can you tell if creating a video is the right decision? Ask yourself if anything about your story would be lost if you told it without the benefits of visuals and sound. If the answer is no, consider a format that requires less of a commitment (both to produce and consume). If the text version is well received, you can decide down the line if you want to repurpose the content as a video. As is the case with any tactic, the decision to create content as a video should trace to your marketing goals. Fortunately, from a marketer’s standpoint, video offers a range of creative and strategic options that can be applied to virtually any content marketing purpose. Top of funnel: Educational videos – They don’t blatantly promote your product or service but reveal valuable and useful information to help your audience understand how their problem can be solved. Middle of funnel: Explainer videos – They can make the perfect pitch every time – literally explaining (not just showing) how your product or service solves the problem. They are also highly shareable on social media. Bottom of funnel: Demos and testimonials – At this stage, your prospects may be more willing to invest their time in learning details about your products or services. By sharing explicit information, step-by-step guidance, or honest customer feedback on your brand’s advantages and disadvantages, prospects can get more comfortable with the experience your solution will provide – giving them the confidence they need to pull the trigger on a purchase. Video can convey an appropriate emotional tone in a way that text alone can’t manage. This makes it an excellent platform for educating viewers on topics and issues directly related to your business and positioning your brand as a credible, trustworthy source of vital information. Host a video roundtable discussion to debate and discuss popular topics of interest from multiple points of view. Create a video showpiece that demonstrates your company’s expertise and/or the unique role your products play in an area of interest that your audience might share. Film your response to a sensitive public relations issue or controversial event to show the values your brand stands for. As a bonus, the Slide video ends with a link to a microsite that explains the technology behind the invention, and gives viewers a glimpse of other automotive technology projects Lexus has in the works. Beyond brand-building benefits, video is ideal for topic tutorials, product demos, process guides, and other practical resources that help you live up to the promises of value and service your brand makes to its prospects and customers. Simplify a complex process with a detailed explainer video that walks viewers through all the steps. Create a how-to video to demonstrate a hack for a more complicated solution. Compare and contrast products or solutions with a thorough review of their key features and functionalities. Here’s a cool explainer video from The Hire Lab (formerly WizZki), an online hiring platform. Watch how the first seconds tell an engaging story (including superheroes and villains) and introduce the characters and their problems; at the 40-second mark the brand appears to save the day. Once the viewer is hooked by some fun storytelling, the rest of the video explains how the app solves the characters’ problems and even shows a few features. Through video, you can offer a unique, entertaining, or immersive experience that helps viewers forge a positive, memorable association with your brand and what it stands for. Raise awareness of important social or community issues your brand supports by creating a short film on the subject. Treat your audience to a behind-the-scenes glimpse of a popular industry event or other relevant activity that few people might get to experience in person. Leverage interactive features and technologies to your videos to enable viewers to participate in the story as it unfolds. Subaru has earned a reputation as a brand that enables sports enthusiasts and active families alike to explore and enjoy the great outdoors. And, given how many people consider their pets to be their loyal outdoor companions, the Barkleys – an active family of golden and Labrador retrievers – are a natural fit for Subaru’s content efforts. As a thank you to its owner community, Subaru recently sent a customizable video, which enables brand fans to virtually insert their own likeness into a fun day at the park with the Barkleys. Not only did the spot tap into the personal passions of its customers, it gave them a way to see themselves (literally) as part of the experience the brand promotes (and share it on social media). While video offers a lot of marketing muscle, it’s not always the easiest technique to master or manage. While the availability of smartphone cameras and low-cost editing tools have made the tactic more affordable than ever, if you want your video content to be seen as professional and authoritative, you need to maintain a certain quality standard. That typically means at least some investment in cameras, editing software, lighting, and sound equipment, as well as in the specialized expertise required to manage the production process from conception to completion. 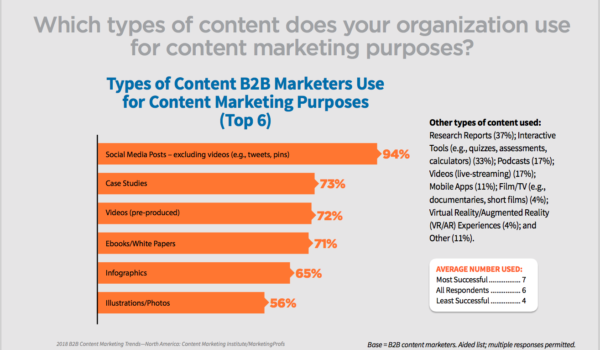 According to CMI’s 2016 Benchmarks, Budgets, and Trends research, 72% of B2B marketers in North America use pre-produced video for content marketing purposes, and 17% are using live-streaming videos. Considering how many videos are competing for attention, just because you’ve created compelling, high-quality video content, doesn’t mean your efforts will get discovered – or viewed – by your target audience, let alone drive the brand recognition and marketing results you are looking for. Considering the high costs and tight competition, brands need to be smart in how they plan, produce, position, and promote their video content if they want to see reliable returns on their investment. Here are some tips for making sure your offerings are as relevant, memorable, strategic, and purposeful as possible – no matter what your budget may be. Your video strategy should be considered part and parcel to your content marketing strategy – not an adjunct feature. Before you pick up that camera, think about the role you want video to play in your brand’s story, and what steps it will take to plot out, produce, position, and measure the performance of this content. Doing this legwork ahead of time will help you make smarter decisions about which video projects will be worthy of the resources you have. Whether it’s awareness, leads, or another goal, every video should have a purpose and a means of fulfilling it. Too often, video success is equated with lots of views rather than with the actions taken by the right consumers after they’ve watched. You can avoid falling into this trap by including a call to action that directs viewers to take the next step on your designated path, as well as by creating a landing page that will guide their journey toward conversion. Use a conversational tone – it makes the video sound more natural, instead of stuffy or forced. Have your talent speak in short, concise sentences to emphasize key points. It makes it easier for your audience to grasp them. Avoid jargon like “optimum” or “accomplish” when simpler words like “best” or “do” will work just as well. Read it out loud (or have someone else read it to you) before you hit “record.” This gives you a sense of any words or phrases the speaker might be likely to stumble on, and how long the finished project is likely to run. Host the video on your owned channels using a video platform like Vimeo, Brightcove, or Wistia. 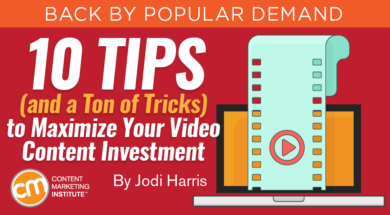 While this method might limit your videos’ overall reach, the flexibility these tools offer means you can customize your videos to look, feel, and operate exactly how you want. It also makes it easier to publish video playlists that encourage visitors to spend more time on your site, as well as to gate your most valuable video assets to drive subscriptions. Post it on a video-hosting site. Using popular video-distribution platforms like YouTube can help get your video in front of a larger audience. Not only is basic use of these services free, the tools are typically easier to configure than self-hosted options, which makes your videos easier to share across content channels and embed in your other content efforts. Go live immediately. If your brand is comfortable with embracing spontaneity (warts and all), you can also create and deliver your videos on the fly through live-streaming platforms and apps – using social media platforms as the “host.” These videos can have a limited reach since they can only be seen by your subscribed followers, and are often only available to viewers for a limited time. This method is ideal for nurturing a participative brand community or capturing unique moments as they unfold. Should you share your videos everywhere and anywhere, or only on certain social channels? Will it benefit your brand to get your video uploaded and running immediately on new social networks that emerge or would it be wiser to wait until others have tested the waters? The answers to questions like these (and most other distribution channel decisions you need to make) are in your buyer personas. Knowing who your audience is, how and where they like to spend their online time, and which channels they prefer for what tasks will help you choose the social networks that offer the best potential for engaging your audience’s interest in your video content. Of course, once you’ve made your decisions, don’t forget to document it in your social media channel plan. Search engines aren’t as adept at indexing video content as they are with text. Creating a full transcript of the copy included in your video helps the content overcome this SEO shortfall. Add relevant tags, titles, and descriptions to the meta data of your video content. This will help your videos be associated with your target keywords and get them indexed to rank for relevant content searches. A screen capture of your videos (along with a link) can be featured in an email sent to the members of your mailing list. This alerts your audience that you have new video content for them to check out, and gives you a forum for requesting their feedback and asking them to help you spread the word. Engagement data and other key performance indicators can provide important insights on your audience’s preferences and behaviors, which you can use to refine and customize your video strategy. For example, if you notice that prospects are dropping off 10 seconds into your videos, your intros might need to be trimmed. Beyond performance statistics, you can also mine the emotional response to your videos –including platform-specific responses – to gauge the value consumers are getting from your videos. For example, in his post on live-streaming video, Josh Brown suggests analyzing the sentiment behind viewers’ use of the expanded reaction buttons introduced by Facebook in 2016: Noting whether they “like,” “love,” or felt “sad” or “angry” after viewing your video can help you determine if your content is moving the needle in the right direction. It takes a lot of work to position video as the high-performing centerpiece of a successful content marketing strategy. But with the right plan, a little creativity, and some smart decision-making, just about any business can benefit from its powerful potential to tell engaging stories and inspire audiences to act.